WIRE ( Women Involved in Rural Electrification) is a non-profit organization that was formed in 1982 as the charitable arm of many electric cooperatives. The organization is known for assisting disaster victims, homeless shelters, children's homes and being involved in a vast array of community projects to reach out to those in need and make a difference in the lives of others. In November of 2011, Newberry Electric Cooperative formed a WIRE chapter and has been very active since that time. Over the past few years, the chapter donated 75 teddy bears to the Newberry County EMS to calm children during emergency situations. The chapter has sent care packages to soldiers overseas. The chapter has also assisted many local non-profits and charities, including The Boys Farm, The Freedom and Hope Foundation, The Newberry Free Clinic, Hospice, MADD, Sistercare, The Manna House, JF Hawkins, White Oak Manor, Springfield Place, Council on Aging, and The Co-op Closet. 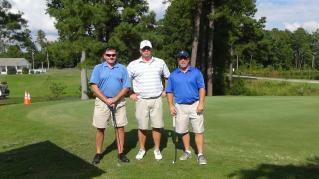 Our chapter started an annual Operation Round Up/WIRE Golf Tournament in 2013. So far, we've been able to raise $28,000 which will stay right here in the Newberry Community. Pictured above is the 1st place team - Carolina Stitches. Any ladies who are members of the co-op and would like to be a part of this wonderful organization, we'd love to have you join our team. Please call (803) 276-1121 for more information. The NEC WIRE Chapter is looking forward to many more projects. Our mission is to improve the quality of life of individuals, families and organizations in the community by providing financial or specific assistance to those with critical needs.